I am super excited to have share today's post with you! What do you love most about writing YA travel novels? Oh, wow! Where to begin? I guess one of the things I love most about writing YA travel novels is that to write a travel novel, you have to travel! I've been traveling internationally since I was 13, and I fell in love with it even then. 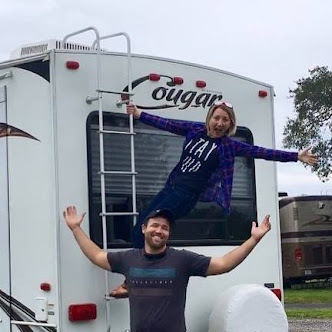 Luckily, my husband has that same love of travel. We use our vacations to check out new cities and countries whenever possible. 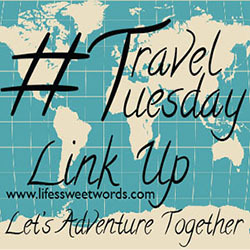 Traveling has inspired several novels (which I hope you'll see soon)! Another thing I love most about YA travel novels, is the adventure/discovery aspect. I can't travel nearly as much as I'd like, so I turn to travel novels to vicariously go on the adventures I long to have. When you're on an international adventure--whether in life or on the page--you discover all new cultures and customs, and you get the chance to view the world in a whole new way. And why YA? Because YA novels are awesome! Young adults are still figuring out who they are and what they want to be. There's so much potential for growth and change. That's a lot of fun to work with as a writer, and a ton of fun to experience as a reader. What are some of your favorite places to visit? My #1 favorite city I've ever been to is Berlin. (Book 2 of the International Adventures series will be set in Germany.) There was so much history packed into one city and it lived comfortably, side-by-side with present-day Berlin. We took a long walking tour, which was an incredible way to discover the city, and our guide said, "The Germans are very upfront with their history. They don't try to sweep it under the rug. Their attitude is: 'This happened, and we will keep it here for everyone to see. That way it cannot happen again.'" We visited back in 2013 and that quote has stuck with me ever since. Another favorite place to visit is, of course, Mexico! It's got a rich, vibrant culture that draws you in from the start. The food is amazing. My mouth is watering just thinking of costras--my favorite kind of taco (you can get a free guide to Mexican food here). And the people... There aren't words. They burn bright. They're loud and full of life. And they welcomed me with open arms. I will never forget my year in Mexico. How do you feel you relate to your main character, Mila? Like Mila, I moved to Mexico without knowing enough Spanish to get by. Unlike Mila, I moved in my twenties after marrying my husband who was born and raised in Mexico. Even though I had my wonderful husband there for support, I was a lot more alone than Mila, who's constantly surrounded by her host family, because I was stayed in an empty house for 10-13 hours a day while my hubby was at work. So those feelings of loneliness she struggles with totally come from me! Also, Mila doesn't have a lot of confidence in her body image or fashion. I totally get that. The girls in Mexico are super fashionable, and I felt like my wardrobe never quite added up no matter what the circumstances were. And so many of the girls literally never had a hair out of place. As a young woman who was still growing out her hair that falls somewhere wavy and straight and refuses to go up without a halo of frizz, this was super intimidating. The one thing that I wish I related to? Mila's skills as an artist. I love art supplies. The colors and textures are fabulous. I have more colored pencils and crayons than I could ever use. I walk into art supply stores just to admire the brushes, paints, and canvases, but I have no skill. I get these beautiful pictures in my head but I cannot get them to appear on the page. It's utterly frustrating. So I became a painter with words. And it allowed me to have a ton of fun with Sketchy Tacos. Read it and you'll see how! Who knew that one night of salsa dancing could change the course of a life? When Meg D. Gonzalez accepted Alan’s offer of a dance, she began on a journey that pulled her out of her sheltered life and into a big and beautiful world. Living in Mexico for a year showed her a rich culture and varied landscape that captured her imagination, and she just knew she had to share. Meg would love to connect! You can email her at meg (at) megdgonzalez.com or connect with her on Facebook, Twitter, or Instagram. 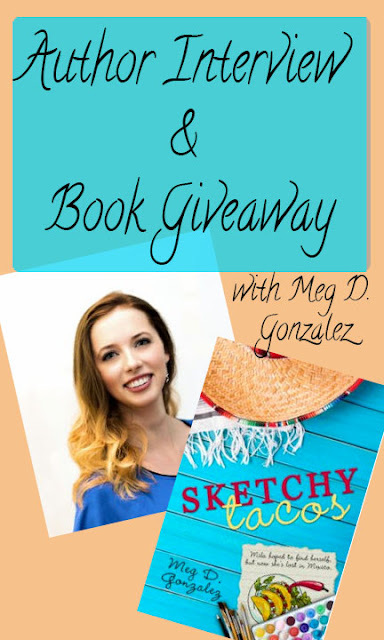 Check out Meg D. Gonzalez’s new teen travel novel, Sketchy Tacos, now only $3.99 on Amazon. "Mila’s summer in Mexico is going to be perfect. She has a plan. If only life would stick to it. After facing everything from a flash flood to Moctezuma’s revenge, from a romantic date for two to a gaggle of snide girls, teenage artist Mila Gulick finds the biggest challenge comes from the war within herself. Her heart, her art, and even her safety are at risk as she struggles to find a balance between cultural differences, old assumptions, and strange romance. Will her trip end in disaster or will she find the strength for which she’s been searching?" To get the latest updates, the first two chapters of Sketchy Tacos, and instant access to the adventurers’ and writers’ resource libraries, click here now! Sketchy Tacos really is a beautiful story, in a vibrant setting! I love getting to "travel", while sitting at home, with the help of a good book! Enter the giveaway below to for the change to take a little trip to Mexico with Mila! How great that you got to interview her! It sounds like a great book! It was a good read for sure :) and so fun to do the interview! What a fun book title. She is adorable. Thanks for sharing this interview. I know! The title won me and the book was great! !